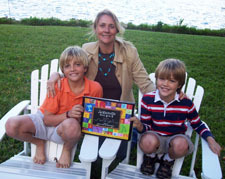 Books by Kids was created by a Florida mom named Heather Surface following the success of the first book that she authored with her two sons, Jamie (11) and Peyton (8). The book, Jacksonville from A to Z, started as a game the Surface family would play on long trips to pass the time. Heather and her husband, Frank, would ask the boys to take turns naming a Jacksonville characteristic, historical figure or venue beginning with each letter of the alphabet. As the list grew and grew, so did an idea! Heather, Jamie and Peyton decided to write a story about Jacksonville based on their research and approached a local non-profit organization called Art with a Heart for Children about the prospect of involving patients from a local children's hospital to create the illustrations. 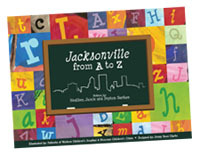 Ultimately, 22 young patients ages 4 - 20 provided 28 beautiful illustrations for the Jacksonville from A to Z book. The Surfaces printed 5,000 hardcover books in December 2008, and they are currently selling them in more than 60 stores and venues around the city. 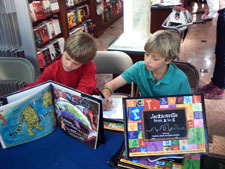 The trio has done numerous book signings all over the city. The book has been responsible for raising thousands of dollars for various child-based non-profit organizations in Jacksonville. Jamie and Peyton attend Riverside Presbyterian Day School in Jacksonville. Heather has a rich background in marketing and communications. She worked for the city of Jacksonville for nearly ten years and was the communications director for the Jacksonville Super Bowl Host Committee. Today, Heather operates a public relations and marketing firm and is involved in numerous charitable endeavors. She is married to Frank Surface, a Jacksonville native who loves sharing all the things he loves about his hometown with his family. As Books by Kids works to publish books in other markets, we think it's important to note the role moms have played in the evolution of our concept. As moms, we're all looking for ways to educate, inspire, motivate and benefit our kids. Moms have been involved in the development of Books by Kids every step of the way! In addition to the role a mom played in the writing and publishing the first book in the A to Z Series, the talented graphic designer for Books by Kids is a Florida mom who works from home so she can spend quality time with her young daughter. The illustrations in Jacksonville from A to Z were created by young patients, but their moms and dads provided much-needed encouragement and inspiration. To all the great moms and dads out there, we salute you!